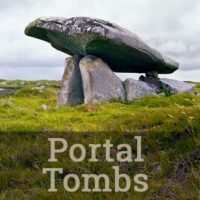 Drag within the image to explore the Grianán of Aileach in virtual reality. 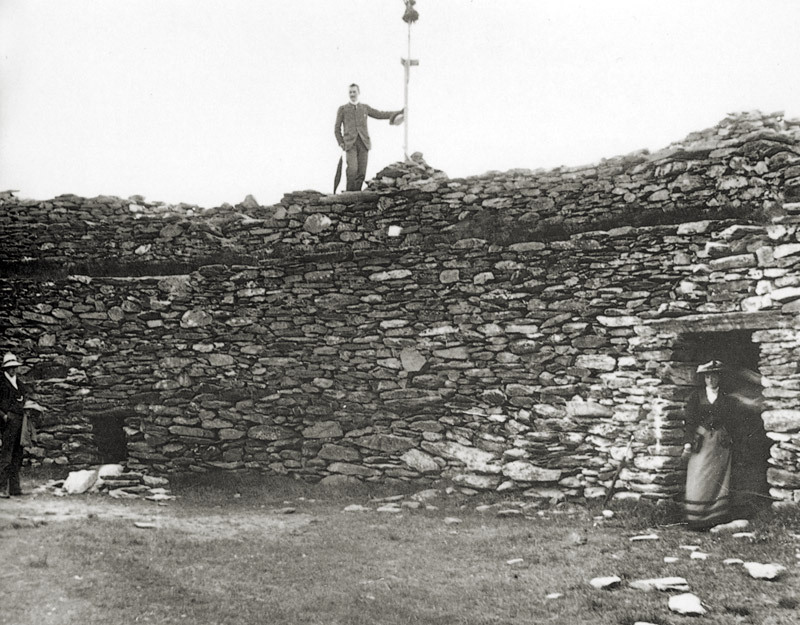 Dr. Bernard and his crew of laborers used for their models other forts they presumed to be of similar antiquity, such as Staigue Fort in Co. Kerry. 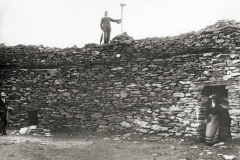 Their reconstruction turned out to be 23 meters (75.5 feet) in diameter and more than five meters (16.5 feet) tall, with walls nearly four meters (13 feet) thick.3 However one can only speculate if the stepped terraces and the alcoves in the interior of today’s Grianán bear much resemblance to what the Iron Age architects may have had in mind. 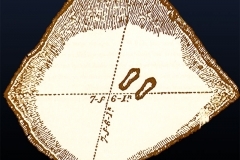 The virtual-reality environment (above) begins with a view of the fort from a distance. Clicking on a hotspot will take you to the top of an interior wall. 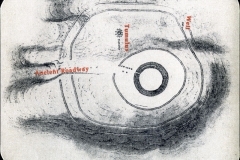 From there another hotspot changes the view to the center of the fort’s interior. 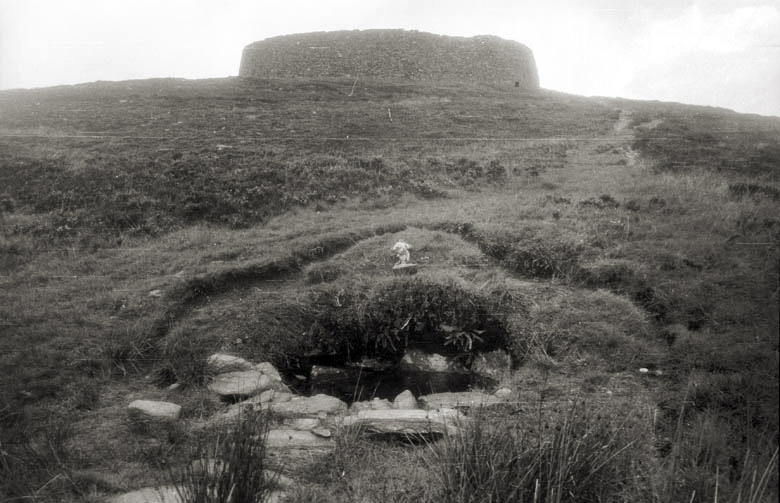 This nineteenth century reconstruction of the structure was only the most recent Grianán of Aileach. to occupy this strategic high ground. 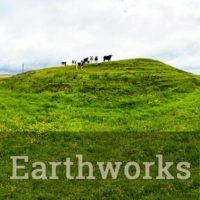 In legend, it was the home of the Dagda. He was the king of the Tuatha Dé Danann who fought the Second Battle of Moytirra against the Fomorians. 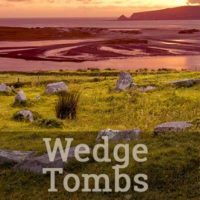 In this story from the fifteenth century Book of Lecan, the Grianán was built over the grave of the Dagda’s son Aedh, who had been murdered. 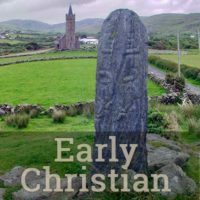 Today archaeologists know that the chronicles7 which placed the time of the Dagda and the legendary construction of the Grianán to around the eighteenth century BCE, have little basis in fact. 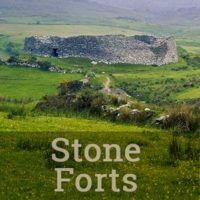 This fort, like other similar ringforts in Ireland, dates from the Iron Age, c. 500 BCE—c. 500 CE. “O Muircheartuch, son of valiant Niall! 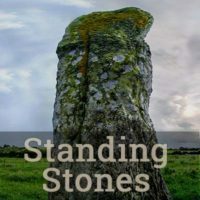 The missing stones resulting from Murtogh’s insult did not act as an impediment when, seven centuries later, Dr. Bernard from Belfast breathed new life into the Grianán with his reconstruction. 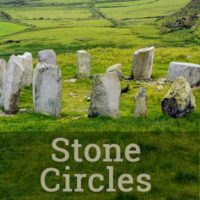 He used the story of this battle to explain why it was necessary for him to scour the hilltop for sufficient stones for his workers to use. 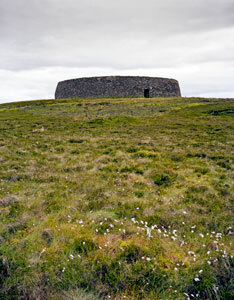 The Grianán of Aileach, has been much altered throughout its history. 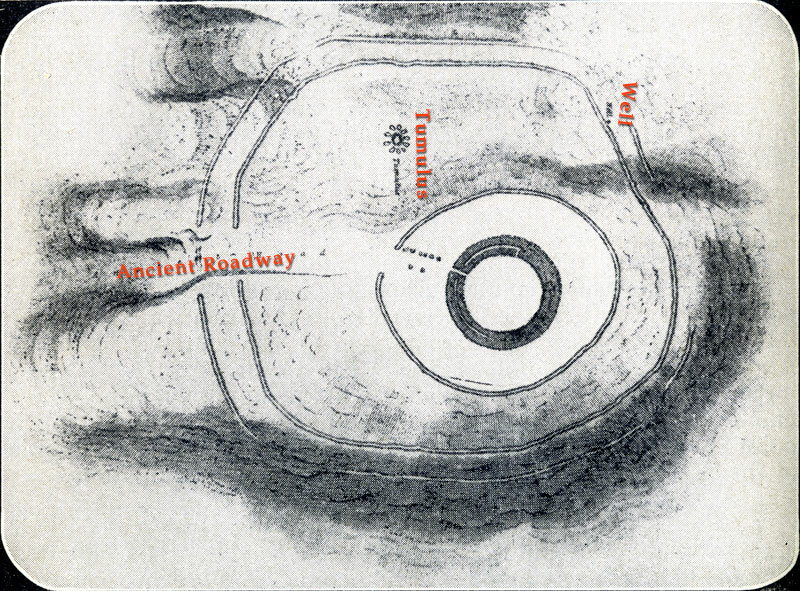 First it was dismantled by the warriors of Murtogh O Brien. 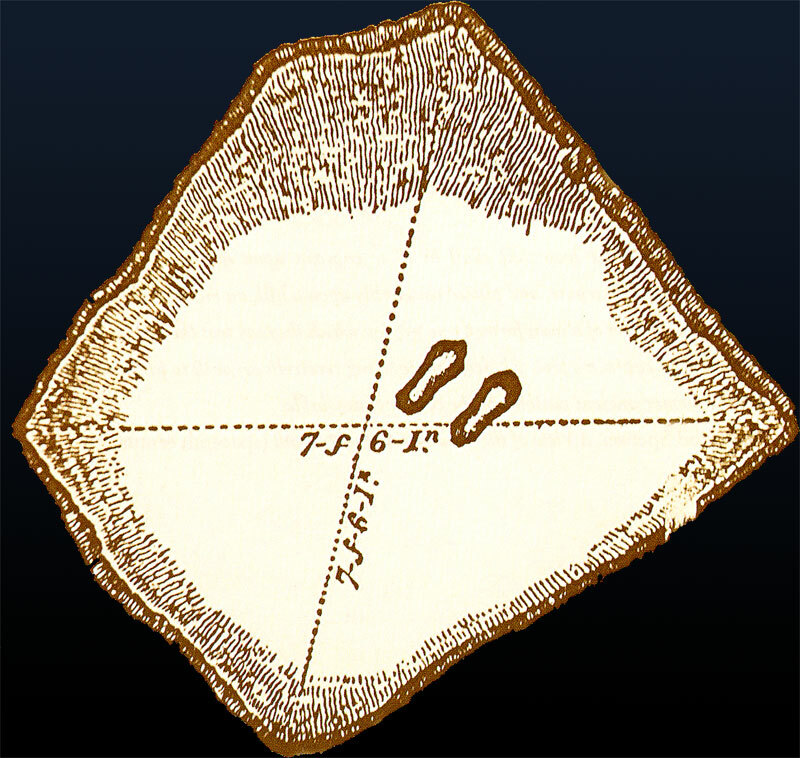 Then came the enthusiastic 1837 reconstruction work of Dr. Bernard. And most recently there was a controversial stabilization scheme undertaken by the OPW in 2007. In history, each generation is able to create its own meaning, as well as its own physical iteration of a monument. The original version of a prehistoric monument is, by definition, the first and the oldest. But it is never the whole picture. 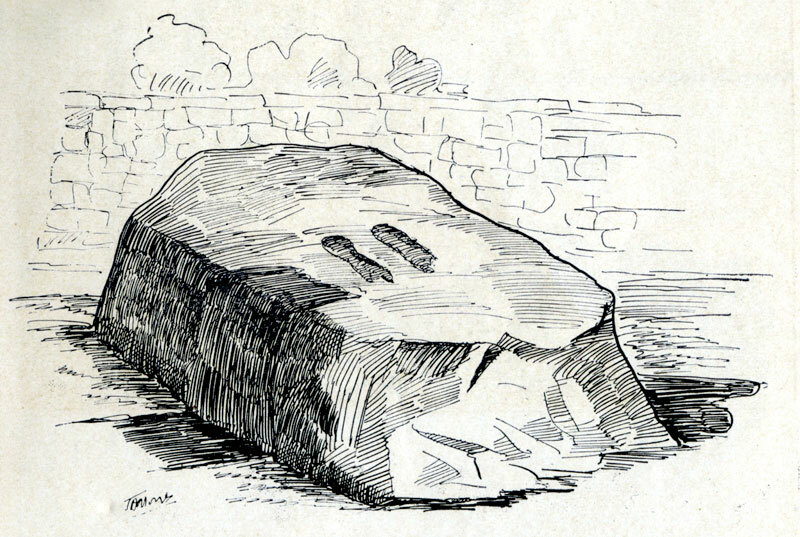 The original monument is the beginning of the story, but the story continues into whatever shape and meaning a nineteenth century antiquarian, or even today’s temporary custodians have provided it. 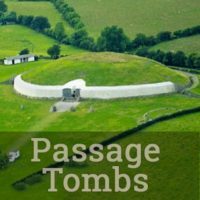 To monitor these changes, the Grianán now has a hero, a protector in the very modern form of a blog singularly devoted to the nuances of its history and to its preservation, Guarding Grianán Aileach.